Kaduna N-power Volunteers Plan Peaceful Rally To Support This Administration Below Is What And How To Participate. 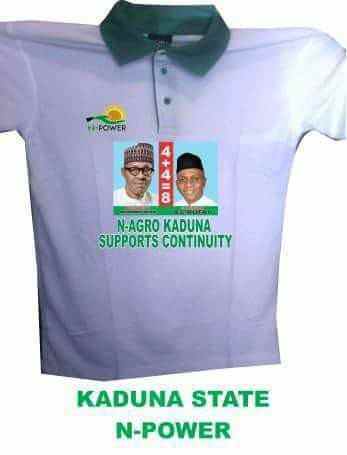 We the Kaduna Sate Npower Beneficiaries (N-Teach, N-Agro & NHealth) will be partaking on a peaceful and coordinated rally in support of this administration. Then pls call the number immediately to notify him of your payment. PAYMENT ENDS ON 21st SEPT., 2018. ALL COLLECTIONS OF THE POLO SHIRTS & P-CAP WILL BEGIN FROM 22nd Sept to the PEACEFUL RALLY DAY (1st Oct). NOTE: TO COLLECT, YOU MUST COME ALONG WITH A VALID MEANS OF IDENTIFICATION, so as to verify your identity. Those residing in LGAs far away the metropolis can pls organise themselves and hand their funds to a TRUSTWORTHY individual to come along and make the payment on their behalves, likewise the collection when it's due, on an account that he/she has to be duly verified (In such case, the phone no. provided should be called for directives). While those living within/close to the metropolis but are willing to pay in cash shall meet ONLY Ishaq Saleh @ GGSS KAWO, KADUNA via the provided phone no.